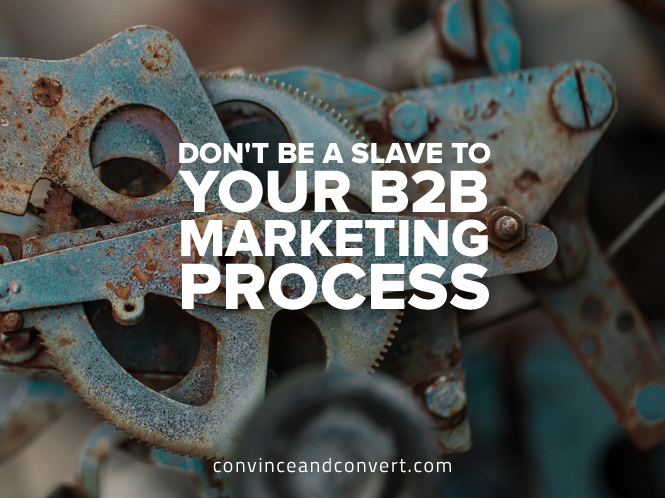 It’s an exciting time to be a B2B marketer. Powerful data sources are fueling a number of new solutions that make big promises to impact our ability to generate pipeline faster. There’s a lead generation provider telling you that they can deliver a warmer lead. There’s a new vendor telling you that they can personalize your website to drive more engagement. There’s an intent data provider or data science company promising a more actionable list for Account-Based Marketing (ABM). Marketers are inundated with cool new ways to approach demand generation. One of the biggest obstacles to implementing these new ideas is inertia—resistance in the form of, “It doesn’t work that way.” Marketers have spent many cycles creating a process related to nurture, inbound, outbound, inside sales, and structure around how these tactics play together. Often, the structure that’s been set up works pretty darn well, so to change it for the sake of a new idea is a big challenge. The question that always comes up is this: How can you make sure you’re not being a slave to your current process and resource allocation, and find ways to test what’s possible? First thing’s first: Think like an entrepreneur. Marketers are responsible for revenue. There are tons of vendors that are promising you faster time to revenue. Test them. The answer to “more revenue, faster” is out there, but you cannot find it unless you’re relentlessly curious, open, and nimble. If it sounds challenging, it is, but there are some things that can make it easier. Email provides black and white results very quickly. For example, if a vendor is offering you a list of companies or “better” leads, consider engaging that list via email with a down-the-funnel content offer, and then measuring its performance against a control group. All too often, these “better” leads and lists are usually validated via sales. This can often take a long time to validate and, at best, result in non-data driven feedback. At worst, the result in a lack of faith in new marketing initiatives. Platforms like LinkedIn, Taboola, and Outbrain can also be good testing grounds for enhanced ABM lists. All of these platforms have added the ability to target a list of accounts and drive traffic to first-party marketer landing pages, meaning you can get immediately measurable results. If you’ve exhausted email testing, and sales engagement is needed to make a major investment, find yourself a sales rep who’s open-minded and willing to test and help you track results scientifically. How often do you hear vendors say, “Get buy-in from sales,” or, “Align with sales,” when you know it’s not that easy. Find that one advocate who is willing to try something new and recognizes the benefit to them. It can do wonders in terms of commercial investment and is great internal PR for marketing. Can’t find your sales-side partner-in-crime? Email down-the-funnel content to the “better” leads, and set up a campaign that automatically routes responses to a sales person. Even though the lead may not have had two to three touches in marketing automation, they responded to a down-the-funnel email, so you’re really just manually skipping some steps to test the creation of pipeline. They won’t approach the exercise with any bias (good or bad). You can compare the pipeline generated from the campaign with that generated from leads that matriculated through the current nurture process. Most importantly, work with vendors that get it. You’re investing time and a little bit of money, and you’re working against your own process and resource allocation—the very least your vendors can do is to be flexible to help you prove the case of ongoing engagement. If their product is too clunky to support a reasonable proof of concept period and pricing, then chances are they’ll never be able to scale across your processes anyway. Your vendor partners are, literally, entrepreneurs, so they should be willing to join you on your path to finding revenue faster and earn their way into your strategy. A company that has taken this entrepreneurial approach to its marketing is Turbonomics (formerly VMTurbo). Having grown its database rapidly, the Turbonomic’s marketing team was challenged with gaining insights about their audience in order to move past a “batch and blast” approach to email marketing campaigns and subsequent sales follow up. The company conducted an A/B email campaign using Surge for Email. Bombora monitors the research behavior and locations of companies across a massive data co-op of B2B media, analysts, marketer’s websites, and more. One actionable stream of this is “surge” data, which indicates when a company starts consuming content on a topic much more than they normally do, according to historical data and benchmarks. It utilizes these insights in Surge for Email, which maps and appends intent topics to individual contacts (inside of marketing automation systems) that a company has already acquired and is marketing to. Turbonomic’s A/B test resulted in a 36 percent increase in email opens between the Surge and control group, validating the correlation between intent and email engagement. Turbonomics also had its inbound sales team call all responders across both groups, which further validated the test, with 80 percent of all opportunities generated from the campaign coming from the Surge test group. By taking a chance and making a change, Turbonomics was able to test the data alongside its regular process and measure the results. It’s clear that we are experiencing a wave of exciting innovation across B2B demand generation. Selectively and tactfully challenging your current processes with an entrepreneurial spirit will ensure that you’re maximizing marketing’s role in revenue generation. Mike Burton is the Co-Founder & SVP Data Sales at Bombora. Mike has been working with AdTech start ups since 2002 and is responsible for driving adoption of Bombora’s offerings across email marketing, analytics, programmatic display, predictive analytics and lead scoring, and countless other applications. Mike took on an integral role in building B2B’s first intent data co-operative, helping Bombora to consolidate over 9.3 billion monthly B2B behavioral interactions.